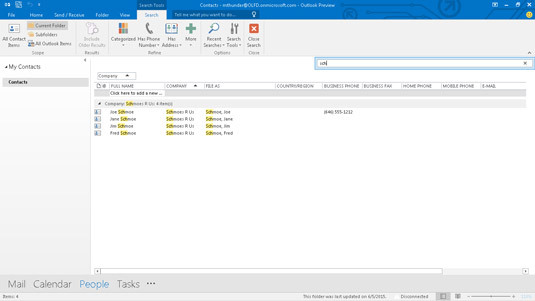 Outlook makes it easy to accumulate dribs and drabs of data. That can make it tough to find information. Outlook has a tool called Instant Search that addresses that exact problem — and it’s pretty slick. Near the top of the Information Viewer pane, in the center of the screen, you see the Instant Search box. It’s a box with a magnifying glass on the right and some text on the left. Click that box and type the first few letters of a word you want to find within the current module. Almost immediately, the Information Viewer screen goes blank, then shows only the items that contain the text you entered. For example, if you’re in the Contacts module and you type jon, you see only the records that contain names like Jones, Jonas, and Jonquil — any word that contains the letters jon. 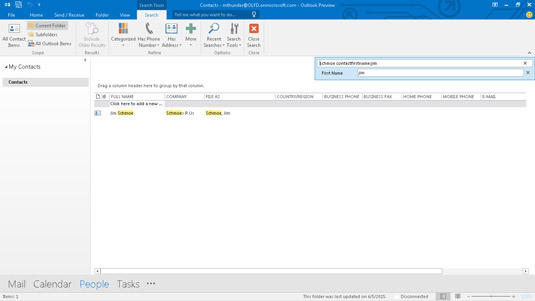 While Outlook is displaying the items it found, the magnifying glass is replaced by an X. Clear the search results by clicking the X. The Instant Search box helps you find items in a jiffy. In some cases, searching for a certain group of letters isn’t specific enough. For example, you may want Outlook to just show the people named Jones and who work for XYZ Company. You can create a more detailed search by clicking the More button on the Ribbon after you click inside the Instant Search box to activate it. That reveals a group of labeled boxes you can select to search for specific types of information. The exact collection of boxes varies according to which Outlook module you’re searching. If you’re in the Contacts module, you have such choices as Name, Company, Business Phone, and so on. To find all the Joneses at XYZ Corporation, search for the name Jones and the XYZ Company; instantly, you’ll be keeping up with the Joneses at XYZ. You can also perform more detailed searches. For example, you can search by name and by company at the same time. 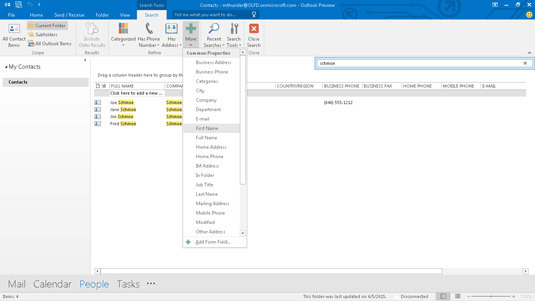 If the items Outlook offers don’t meet your needs, you can make different choices by clicking the label for each type of information and then you can see a list of other kinds of information to search for. For example, when you’re searching your Contacts list, you can pick City or State to find people in a certain location. Change the search types by clicking the More button and then choosing a label to reveal a list. The best way to understand the Instant Search feature is to try it out. Just type some information into the box to see what you get and then click the X to create a new search. If you get a lot of results, try using the More button to narrow the list.